BRITE-Constellation is an international space astronomy mission consisting of a fleet of 20x20x20 cm nanosatellites dedicated to precision optical photometry of bright stars in two photometric colours. The mission continues in full science operations, with 22 data releases to BRITE target PIs having already taken place, and many datasets available in the public domain from the BRITE public archive. The BRITE mission is a collaboration between Canadian, Austrian and Polish astronomers and space scientists. The Canadian partners represent University of Toronto, Université de Montréal, Bishop’s University, and Royal Military College of Canada. The mission was built and is operated by the University of Toronto Institute for Aerospace Studies Space Flight Lab (UTIAS-SFL). The Canadian Space Agency funded the construction of the Canadian satellites, and continues to fund mission operations. BRITE Toronto (Canada): Toronto observes with a red filter. It is currently observing the Lac/Cyg field and the Taurus field. BRITE Lem (Poland): Lem observes with a blue filter. It is also observing the Taurus field. BRITE Heweliusz (Poland): Heweliusz observes with a red filter. This satellite is observing Vel/Pic III field, after recently completing a campaign observing the Pegasus field. As implied by the numeral ‘III’, the current campaign on Vel/Pic represents a revisit of a previously-observed field. BRITE Austria (Austria): BRITE Austria observes with a blue filter. It is observing the Cassiopeia II field. UniBRITE (Austria): UniBRITE observes with a red filter. This satellite is currently observing the Vel/Pup IV field. The BRITE Constellation observing programme from early 2017 through early 2019 has been planned by the BRITE Executive Science Team (BEST), and details are available on the BRITE photometry Wiki page. Fig. 1: Complete BRITE-Toronto light curve of 43 Cygni (top) and zoom into a 20-day subset (bottom). From Zwintz et al. (2017). Zwintz et al. 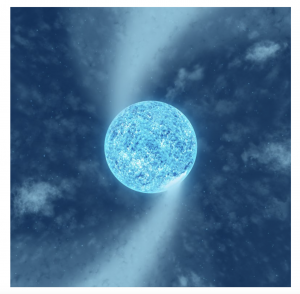 report that photometric time series of the gamma Dor star 43 Cyg obtained with the BRITE-Constellation nano-satellites allow a detailed study of its pulsational properties, leading to new constraints on its interior structure. 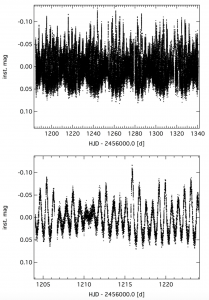 They attempt to measure a g-mode period spacing pattern, yielding the near-core rotation rate of 43 Cyg and a redetermination of the star’s fundamental atmospheric parameters and chemical composition. 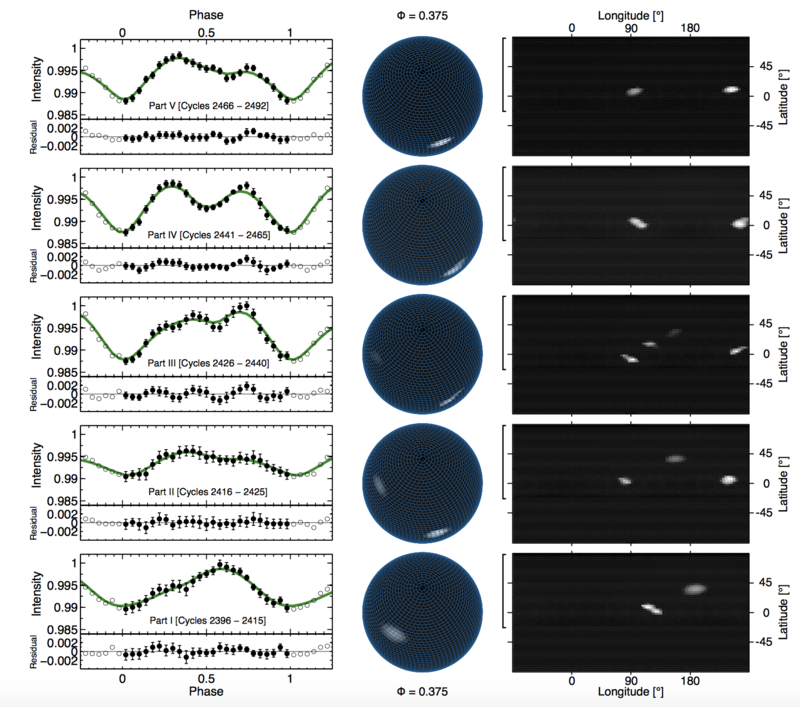 They conducted a frequency analysis using the 156-day-long data set obtained with the BRITE-Toronto satellite and employed a suite of MESA/GYRE models to derive the mode identification, asymptotic period spacing and near-core rotation rate. They also used spectroscopic data to redetermine the fundamental atmospheric parameters and chemical composition of 43 Cyg. They detected 43 intrinsic pulsation frequencies and identified 18 of them to be part of a period spacing pattern consisting of prograde dipole modes. The near-core rotation rate was determined to be frot = 0.56+0.12-0.14 d-1. The atmosphere of 43 Cyg shows solar chemical composition at an effective temperature of 7150 K, a log g of 4.2 and a projected rotational velocity, vsini, of 44 km/s. The morphology of the observed period spacing patterns shows indications of the presence of a significant chemical gradient in the stellar interior. Fig. 2: Illustration of the photospheric bright spots of zeta Pup reported by Ramiaramanantsoa et al. (2017) and their driving of CIRs at the base of the star’s wind. Ramiaramanantsoa et al. report that BRITE photometric monitoring has revealed two simultaneous types of variability in the O4I(n)fp star zeta Puppis: one single periodic non-sinusoidal component superimposed on a stochastic component. The monoperiodic component is the 1.78 d signal previously detected by Coriolis/SMEI, but this time along with a prominent first harmonic. The shape of this signal changes over time, a behaviour that is incompatible with stellar oscillations but consistent with rotational modulation arising from evolving bright surface inhomogeneities. By means of a constrained non-linear light curve inversion algorithm they mapped the locations of the bright surface spots and traced their evolution. 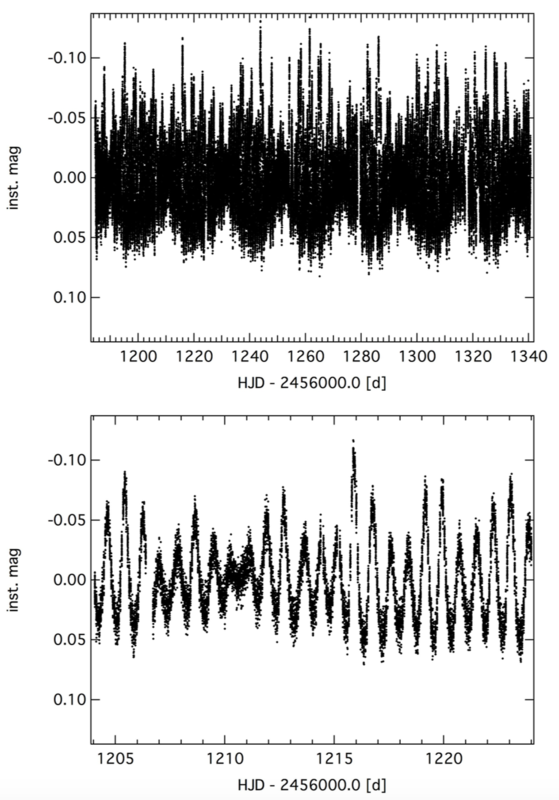 Simultaneous spectroscopic monitoring of the star shows cyclical modulation of its He II 4686 &#x212B wind emission line with the 1.78 day rotation period, showing signatures of Corotating Interaction Regions (CIRs) that appear to be driven by the bright photospheric spots. Traces of wind clumps are also observed in the 4686 &#x212B line and are correlated with the amplitudes of the stochastic component of the light variations probed by BRITE at the photosphere, suggesting that the BRITE observations additionally unveiled the photospheric drivers of wind clumps in zeta Pup and that the clumping phenomenon starts at the very base of the wind. The origins of both the bright surface inhomogeneities and the stochastic light variations remain unknown, but a subsurface convective zone might play an important role in the generation of these two types of photospheric variability. Fig. 3: Light curve inversion mapping of the photosphere of zeta Pup as observed by BRITE in 2014-2015. Time increases upwards. The left panel illustrates the observed light curve (filled circles) during different parts of the BRITE observing run, along with the reconstructed light curve (green line), with the residuals plotted below the light curves. Then follows a view of the star at rotational phase 0.375 (Middle panel) and the pseudo-Mercator projection of the stellar surface (right panel). The vertical open brackets on the left of the pseudo-Mercator projections indicate the range of latitudes visible by the observer. The sub-Earth point is at longitude 0 deg at rotational phase zero. From Ramiaramanantsoa et al. (2017). A press release related to the publication of these results is available here. The proceedings of the second BRITE Science Conference – held in Innsbruck, Austria in 2016 – are now available.